Nifty Paradox: Nifty Cracks 8000 - What Next? Nifty Cracks 8000 - What Next? Well the fall from 8180 has been sudden and there is a lot of blood bath on the tickers. For safe traders who missed the boat last month. 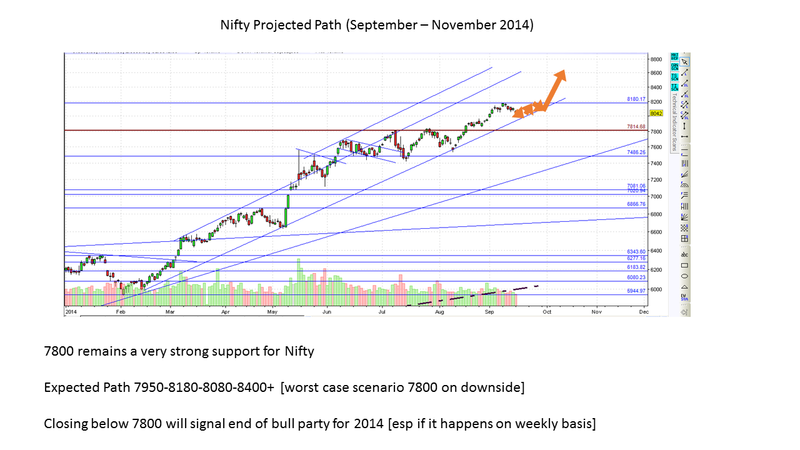 7950 levels is a low risk entry point and the next one will be around 7825 levels. Regardless of what the media says, this is a technical correction and a very healthy one. Unless Nifty closes below 7800 [especially on a weekly basis] current levels seem extremely tempting to go long. Initial upside is 8180 followed by 8400 levels i.e. 300-350 points per lot on upside. Very few times, such low risk high reward plays come into the picture. Corresponding support on BankNifty would be around 15700-15800 levels from where another attempt at 16500 can be expected.